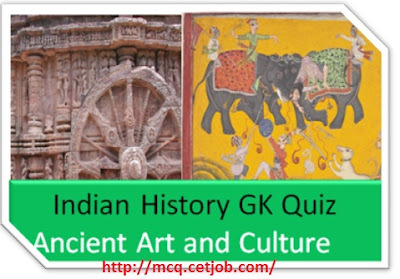 As we know that in the various government, Universities Entrance test and non government exam having some questions on Ancient Art and Culture of India. So, we give some most important objective questions and answers based on Indian ancient history based questions which helps you to get more knowledge on History part. This section contain previous year questions of various exams like SSC, PSc, UPSC, Bank Exam, TET, Constable, Police bharti etc exams. 1. Which of the following inscriptions is found in purest Sanskrit? 3. In which of the following places Vardhaman attained the state of enlightenment? 4. Who was the patron king of Pataliputra Buddhist Council? 5. Who deciphered Ashokan inscription? 6. Which of the following is not a holy book of Jainism? 7. In which of following Buddhist councils compilation of holy books was completed? 8. Who was the founder of Pataliputra? 9. Which symbol shows renunciation? 10. Which Mauryan king holds the title of Amitraghata? 11. Kailasha temple of Ellora was built by? 12. Dasavatara temple of Nagra style is located at which of the following places? 14. Who is known as the Napoleon of India? 15. Who wrote Si- Yu- ki? 16. Panchasidhantika, written by Varahmihir is based on? 18. Which of the following books is based on Astrology? 19. Who established Nalanda Mahavihara ? 20. Bagh painting of Gupta Empire was found in which of the following Indian states? 21. Most depicted animal of the Indus Valley Civilization was? 22. What was the capital of Avanti? 23. Which of following Chalcolithic sites comes under Ganges system? 25. Which of the following metals was not known during the Indus Valley Civilization? 27. Which of the following is not a religious text? 28. Satavahana dynasty originated from? 29. Which of the following is related to Etymology? 30. Kalinga was situated between?